The Carthaginian general Hasdrubal and his armies are reported to have marched into Gaul en route to Italy in 208 or 207 B.C., crossing the Pyrenees in the west "near the Ocean", according to Titus Livius and Appianus. After the defeat of the Carthaginians, Roman generals undertook the conquest of Hispania, a territory which in the course of time they brought under their dominion. 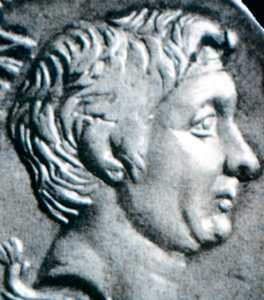 Quintus Sertorius, governor of Hispania Citerior, remained loyal to his superior Caius Marius during the latter's struggle against Pompey Magnus, rising up against Rome with the support of several local tribes from the valley of the Ebro, in the so-called Sertorian Wars, waged between 77 and 72 B.C. In 75 B.C. 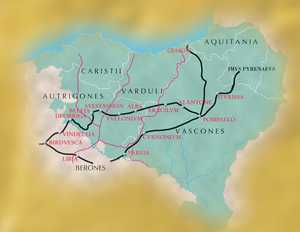 Pompey arrived in Hispania to do battle with the rebel, but finding himself short of provisions, retreated into the lands of Vasconia and that same winter founded the city of Pompeopolis (Pamplona). Julius Caesar subdued the Gauls, killing over a million people in the process, according to Pliny, who disapproved of the conqueror's methods. In 56 B.C. one of Caesar's generals, Publius Crassus, did battle with the Aquitanians, who sought help from their Peninsular neighbours. The coalition was defeated and after the battle the greater part of Aquitania surrendered to the Roman. During this two-century long period the local inhabitants gradually began to emerge from their anonymity. Contemporary Roman chroniclers remarked on their uncivilised customs, the simplicity of their lifestyle and their warlike nature, clearly seeking to emphasise the beneficial effect of Roman influence on this savage and uncultured race. 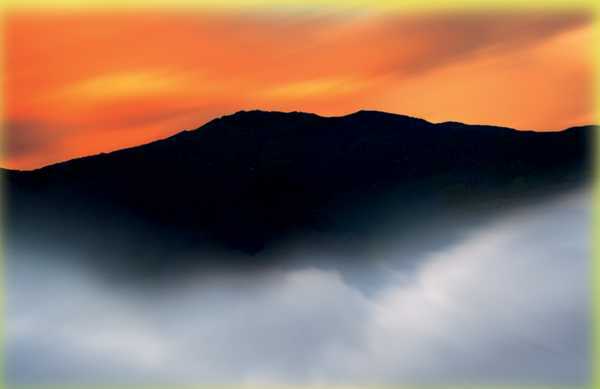 They attributed the wildness of the local people to the hostile climate and remoteness of the region. The natives were said to live off acorns for most of the year, to have scarcely any wine and to drink beer. Their dress was simple, at celebrations they ate in communal groups, they used rudimentary boats and their rites of worship were primitive. 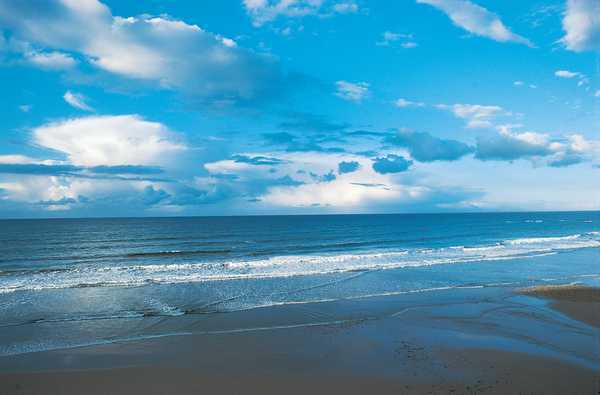 Nevertheless, reference is also made to a road stretching from Tarragona on the Mediterranean coast to the last coastal Vascon settlements at Irun. Later on, in the middle of the first century A.D., sources referred to Vascon, Vardul and Caristian tribes living in the region which is now the province of Gipuzkoa. 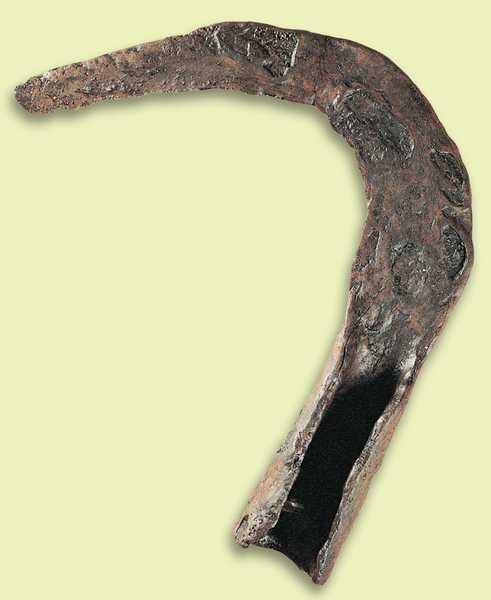 Over the last twenty years, archaeological research into the period prior to the Romans' arrival in Gipuzkoa has yielded important new findings. Two distinct and contemporaneous cultures have been identified (Peñalver, 2001); one has its expression in cromlechs - stone circles with a funerary function - while the other manifests itself in hill-forts (castros). 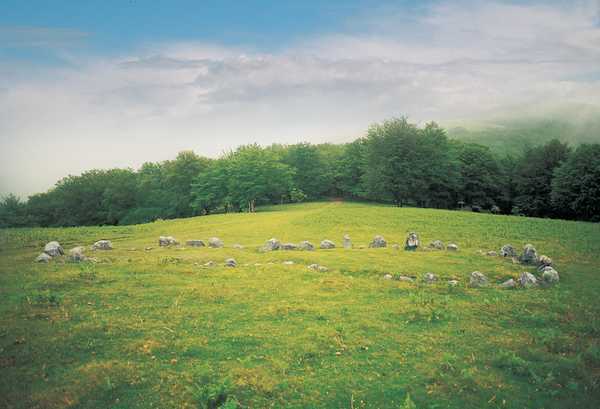 The cromlech region begins in the Leizaran Valley, running eastward along the foothills of the Pyrenees as far as Andorra, in a strip of mountain-land between 5 and 40 kilometres wide. This area is thought to have belonged to a distinct group who, on the basis of the geographical evidence, would appear to have been the Vascons. The Leizaran borderline lies close to the tribe's westerly territorial limit described by contemporary geographers. 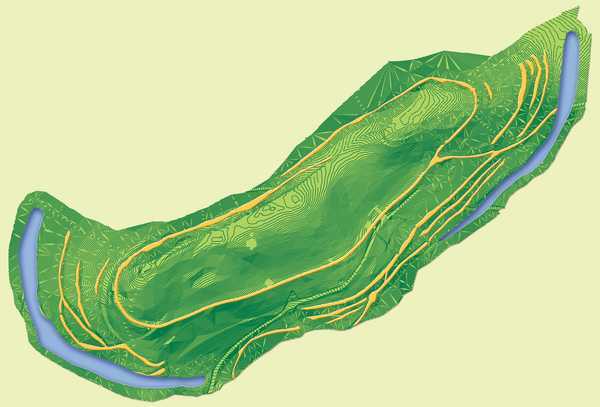 Fortified settlements, on the other hand, are found in the area adjoining the cromlech area, in Gipuzkoa (Intxur in Albiztur, Buruntza in Andoain, Basagain in Billabona, Muñoandi in Azkoitia-Azpeitia, Murugain in Aretxabaleta-Arrasate-Aramaiona, and so on) as well as in Navarre, Labourd, Lower Navarre and Soule. These were large-scale permanent settlements; indeed, the hill-fort at Intxur occupies one of the largest areas of any settlement of its time. They were located at strategic sites and equipped for defence with walls and great fosses; inside the fortified area stood dwellings, inhabited by people who engaged in arable and livestock farming and who had knowledge of iron-working. Amongst their hoards have been found certain articles characteristic of the Celtiberian world, although never in large numbers. In this same "Celtic" context we may also include a burial stele discovered in Meagas which shares features with objects found along the coast of Bizkaia. The people do not appear to have been as isolated or uncultured as contemporary sources claim, but geographically they do appear to have been distributed along the general lines given in Roman writers' descriptions. 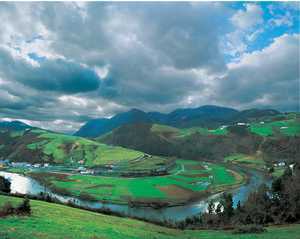 Gipuzkoa at this time was a crossroads between several cultures: Aquitania, the Ebro valley, and the Pyrenean and Cantabrian mountain ranges. The Bidasoa River marked the boundary with the peoples of Aquitania and also the northernmost limit of the cromlech region of the Vascons, which extended south and west to the Leizaran Valley and east along the Pyrenees; the area is bordered by the fortified settlements, which we may assume had connections with the Celtiberian world to the south. To the west, the River Deba separated the Varduls from the Caristians, whose lands stretched as far as the Nervion river. These two groups occupied territories that extended further south into the modern-day province of Alava. 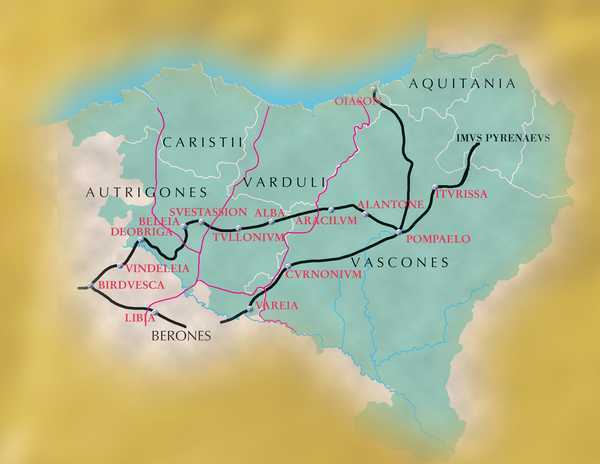 Roman texts referred to the various settlers of modern-day Gipuzkoa as Vascons, Varduls and Caristians, and it is by these names that they are known to history. 26. Canoes, carved out of a single tree trunk, were used for simple river navigation from the pre-Roman era until well into the Middle Ages.